I consider myself one of the least "handy" guys on the planet. Seriously, nailing two boards together is usually a challenge for me. But I decided to take a stab at making my own aquarium stand, knowing full well that if I did it improperly it could mean disaster. It was quite the adventure, but I'm pretty happy with the end result and I had a lot of fun and learned a lot along the way. 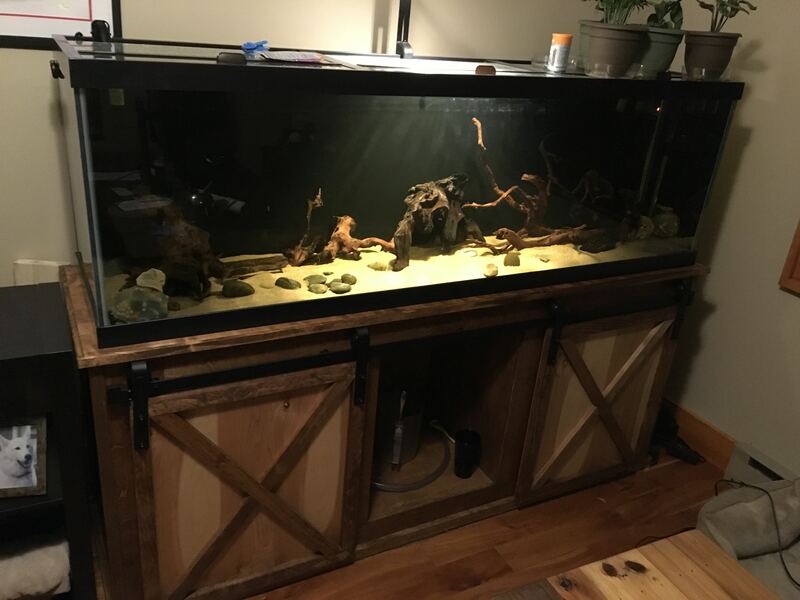 Here is a photo of the finished stand and tank (not completely 'scaped yet). And here is a link to progress photos. Sorry, no actual photos of my CLs. But there are 4 of them in the new setup, and they have been with us for over a decade. In large part thanks to this forum. Many years ago, you kind folks helped me through some early beginner troubles and a battle with ich and skinny disease. We lost our 5th during those early days, but I thank you all for helping to save the 4 that remain with us. Looks great! I like the barn doors! Do they slide? Great job! I like the rustic look too. It probably looks good with your "mountain" home. I applaud your DIY bravery too...I'm not there yet, lol. The doors do slide. I can move them over to the middle compartment to open up the side compartments, where the filters are housed (an Fx6 and an Fx4). I originally decided to go with the barn doors because I didn't trust myself to properly hang traditional hinged doors. I've tried hanging actual doors and kitchen cabinet doors around the house before and it never ended well. However, in hindsight, I'm not sure the barn doors were that much easier to do. Getting the hanging of the hardware right, in particular, was a challenge. Thank you! With youtube and the information you can find on various forums now-a-days I feel like DIY projects that were once way out of reach of someone with my (lack of) skill, are now more doable. Also, the actual 2x4 frame is all that is really needed to hold the tank. I could have theoretically called it a day after getting that built properly (level and squared), assuming of course that I didn't care about how it looked. But I was on a roll and had the DIY bug at that point so I kept going with it. The "skinning" and the "staining" and the "doors" are what took up a majority of the time (and money!). I'm already looking forward to the stand I'll have to build for a maybe, possible upgrade several years from now.